I know I say it every month, but I really can't believe how quickly the time has gone by. Nine months feels like such a milestone. In just three months time Mathilde will celebrate her first birthday. How is that even possible? Every day my little one grows a little more and learns a little more. Every day she is becoming more a little girl and less a baby, both in appearance and behaviour. Mathilde's latest hijinx invlove climbing to the top of the ladder on Ava and Lola's bunk beds. She's fine going up but she hasn't worked out how to get back down. For now the ladder is taken down during the day and only goes back up at night. We're going to have to come up with a more permanent solution to stop this little monkey. She's always working on her fine motor skills. She tries to put on her shoes, likes holding pencils, hits at the xylophone with a stick and tries (unsuccessfully and messily!) to feed herself with a spoon. Mathilde is still enjoying her swim classes. She's a happy baby pretty much most of the time but put her in the water and she's happy on a whole other level. Water really is her element. She has recently learnt how to blow bubbles in the pool and she is so excited about it. Ok, I'm excited about it too. Mathilde is so close to being able to walk on her own. She walks along furniture, reaching across to the next chair or table when there's a gap. She walks quite long distances holding onto one or both of my hands. It's slow going but she always looks so proud of herself. And her Toddler Wobbler walker is her best friend. She walks up and down the hallway pushing her walker full of toys. It's so cute. Mathilde still doesn't have any teeth but, hey, I'm not complaining about that! I'm more than happy for her teeth to take their sweet time. Ava didn't get her first tooth until 11 months and Lola was 9 months when her first came through. Mathilde's gums look a little swollen and she has been a little grizzlier than usual lately so maybe by next month's update her gummy smile will be replaced by a little toothy one. 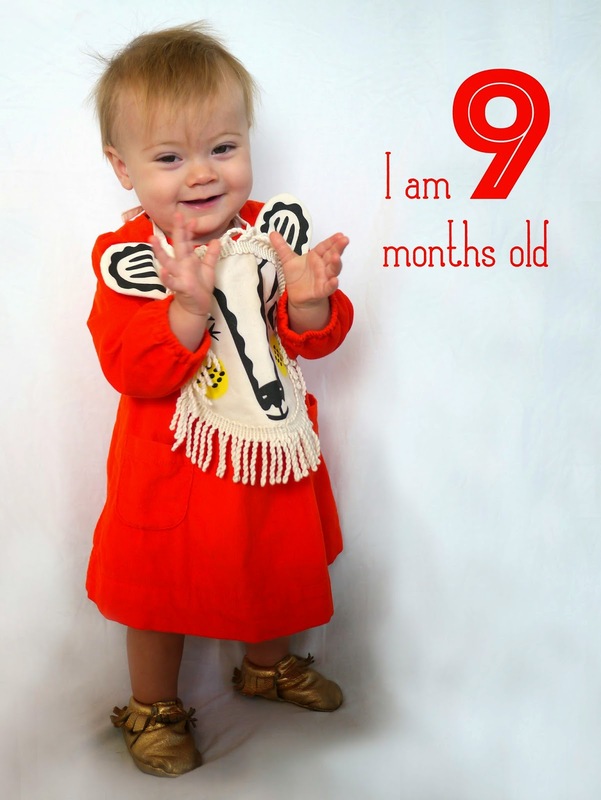 Nine months! I still can't believe it. I guess I'm going to have to start working on birthday party ideas soon. Hooray!